Review PreserVision Lutein Soft Gels Thankyou everything just fine as it would appear these capsules are hard to find. I buy 4 months at a time so hope you still have them in the future. Review PreserVision Lutein Soft Gels These were recommended by my ophthalmologist and I am sufficiently convinced that they are helping my vision that I continue to take them. Review PreserVision Lutein Soft Gels These are for my husband, yours are the best on the market for value & convenience! PreserVision Lutein Soft Gels Good product! PreserVision Lutein Soft Gels My optician advised me to take those. Great supplement! 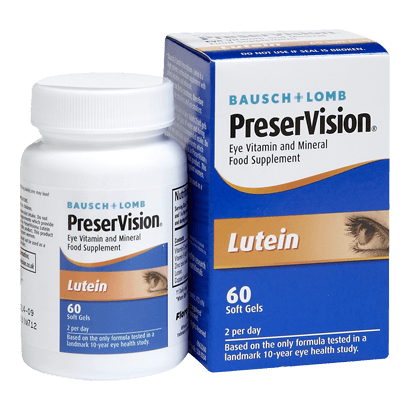 PreserVision Lutein Eye Vitamin and Mineral Supplements from Bausch & Lomb are uniquely-formulated, clinically-proven, health supplements for your eyes. These soft gels support healthy vision, especially in later life. Manufactured by Bausch & Lomb, one of the world's leading producers of eye care products, these high-potency vitamin and mineral supplements are rich in antioxidant vitamins C & E and mineral Zinc. They are suitable for adults with vision problems (including smokers) and especially beneficial for those aged 40-60. PreserVision Lutein Soft Gels are developed from Bausch & Lomb's exclusive AREDS formula, making the supplements an excellent choice for those who must avoid beta-carotene. Made using high-quality ingredients in strict accordance with the rigorous pharmaceutical standards, PreserVision Lutein Soft Gels will also protect the macula of your eyes from free radicals and toxic chemicals that are formed due to prolonged exposure to UV rays. This is mainly because of an ingredient known as Luetin, which is a member of carotenoid family of plant pigmentation. Although you can find Luetin in leafy green vegetables, you might not be able to consume them every day.